I’m not sure I had too many misconceptions about copyright and fair use, but I was surprised to learn that it’s not fair use if I cite and author or an artist if I use their work for my students. However, I tend to only use other’s images or writing to enhance students’ understanding of a topic, not for entertainment purposes. That said, I now know that just giving credit to the owner of a work does not mean that it’s fair use. I knew about Creative Commons before doing this module; I use it when looking for music when making videos for teaching and for finding images to put on my class website. As for the quiz, I score 16/20. I got mixed up on a couple of questions regarding trademarks and patents vs. copyrights. There is so much law wrapped up around copyright that it’s kind of overwhelming. I’m sticking with the idea that I can use it if it’s for “transformative” purposes. I’m fairly certain that my students would not fair so well. In the age of Googling everything and having access to so much information, I think students figure that if they find something online (music, movies, games, images, etc.) it’s free to use however they want. As for helping students learn about copyright, I will probably have my school librarian talk to my students for a few minutes before I have them work on their first project I assign, and then I will continue to refer to what she talked to them about throughout the semester. I will also point them to creative commons when searching for images to use in their projects and assignments. I put my attribute license here under the welcome post on my classroom website. I checked out PaperRater and PlagTracker and I liked both of them. PaperRater is neat because you can see which words and phrases you overuse and any spelling and grammar mistakes you might have missed. I’d recommend students use this before turning in papers to me. PlagTracker is nice from a teaching perspective because I can copy students’ work and put it in and see easily if it is plagiarized. (I typically have students submit their work digitally.) And I can point students to the site to let them check their work and make sure they properly cite their information and so they know that I can easily tell if they just copy and paste information from another source. 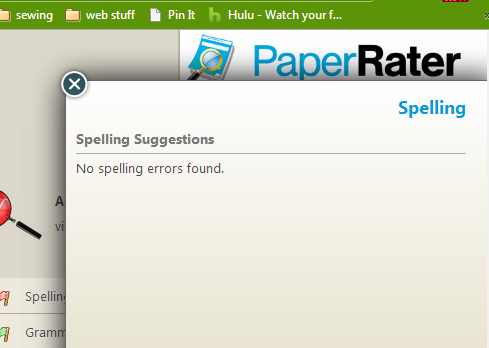 I am going to start using PaperRater myself! It really does catch a lot of things. I am kind of surprised how well it does. The Plagiarism tools you have to be careful of, but they will catch most things.